Rachel M. Thompson, MSN, APRN graduated from Spalding University in 1999 with a Bachelor’s Degree in Nursing. She began her career in Women’s Healthcare working in postpartum, and then Labor and Delivery. Her education continued at the University of Louisville, where she obtained her Master’s Degree in Nursing, specializing in Women’s Healthcare. She is certified by the National Certification Corporation as a Women’s Health Nurse Practitional and has been practicing in the Louisville area for seven years. 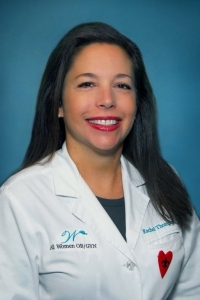 She is a member of the Kentucky Coalition for Nurse Practitioners and Nurse Midwives, as well as the American Society for Colposcopy and Cervical Pathology. She is experienced at providing care to women across the lifespan, including contraception, well-woman exams, hormone replacement therapy and prenatal care. The Kentucky Coalition of Nurse Practitioners and Nurse Midwives states that Nurse Practitioners “are qualified to manage most common illnesses and injuries and provide education for healthy living. Nurse Practitioners have a unique approach and stress not only cure, but care. Nurse Practitioners focus on health promotion, health education and counseling, and disease prevention. Nurse Practitioners help patients make educated, wise choices. Nurse practitioners are nationally certified and practice in a field consistent with their experience and education. As a Nurse Practitioner certified in Women’s Health, I am able to see women for their annual exam, as well as provide prescriptions (birth control, hormone replacement therapy, and antibiotics), order mammograms, ultrasounds, and DEXA scans. I am also able to see women for problems visits (infections, breast lumps, pelvic pain, abnormal bleeding, STD screening), to evaluate, diagnose and treat your specific issue. My experience as a labor and delivery nurse allows me to not only care for women during their pregnancy, but also provide education about their upcoming labor experience. My goal is that all women should be the healthiest they can be, and I strive to assist them through education and encouragement.